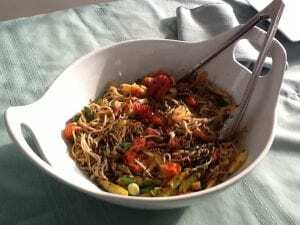 You need to make plenty of miso ginger sauce for this dish since the vegetables are roasted in the sauce and the noodles are bathed in this lovely medley of Asian flavors! If you decide to use the noodles as a side dish, then use the extra sauce as a marinade for meat, chicken, shrimp or tofu! Substantial on it’s own, this vegetable laden soba noodle dish is delicious, healthy and a perfect combination of both winter and early spring vegetable bounty. If you are unable to find good organic parsnips, then substitute with organic carrots or turnips. There is plenty of healthy asparagus this time of year, so use it abundantly! Meanwhile boil 1 package of soba noodles in a pot of salted water until al dente, do not overcook! This dish is fabulous on its on own, yet a perfect accompaniment to miso ginger marinated chicken, shrimp or pork(use the same sauce as a marinade). A wonderful side dish to a vegetarian meal, when served with marinated baked tofu!